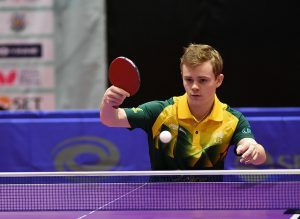 The sole Table Tennis representative at the 2018 Youth Olympic Games of the land down under, Australian Benjamin Gould was working hard at the Pre-YOG training camp held at the CTTC in Shanghai in August. 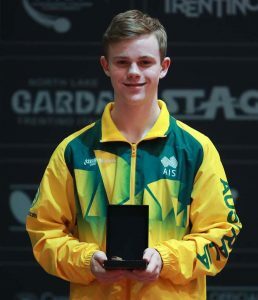 The winner of the Swaythling Club Fair Play Award at the 2017 World Junior Table Tennis Championships is excited to be heading to Argentina in October. Initially he took up Table Tennis because it looked like an easy sport, but he has since changed his mind. I am from Brisbane in Australia. It’s quite a hot place there, and very humid too. So you are used to train in conditions like here at the Pre-YOG training camp in Shanghai? Yes, but at the moment it’s winter in Australia, so I am used to the cold right now. But generally, I am ok with this. You’ll be at an advantage in Buenos Aires then, because you will be adjusted to the season there? Yes, I really hope so. I’m not sure it works like that, but in theory, I think it will work! You won a Fair Play Award last year. What was that for? In the deciding team match at the World Junior Championships against Tunisia, the ball hit the edge of the table at 10:9 to me. No one saw it, except for me, and obviously I put my hand up to tell everyone what was going on! The other player had already walked off the court, so we got him back and continued. I was lucky enough to still win the match, but yes: I was just doing what was right! Well done on that, congrats! Was qualifying for the Youth Olympic Games a goal of yours? Yes, it has been a big goal of mine for the past couple of years. At several points I thought that maybe it was a bit out of reach, especially after the continental qualification. However, after creating new goals for myself of just getting better and being more patient, I was lucky enough to qualify through the world ranking. It is really a big deal for me. What did you do to get there, to reach that goal? Did you have to make any sacrifices? I sacrificed a lot of my schooling and education. I still did it all – but probably not quite to the extent I would have otherwise. But mainly, I just put a lot of time and effort in. Are you continuing with your studies at University level? Yes, I am in University right now, but at a reduced workload, so I can still train. How often do you train, and who do you train with? I train around six days a week, basically with anyone I can train with. It can be my coach, or any training partners I can gather. Typically I have one training session per day. When and why did your first start to play Table Tennis? I first started to play when I was seven years old, because I had a bad hip injury, and the doctor suggested a low impact sport for me. Of course at the time my parents and I thought Table Tennis was very easy, so we went ahead and tried it. Then I just fell in love with the sport and how great it is, and continued to try and get better at it. So do you still think it’s easy? I really admire Roger Federer. I love how humble and calm he is when he plays. I am really trying to work on the mental side of my game, and for me, he is just the perfect role model. What are some of your other goals, besides the YOG? I want to become involved in a finance related field after my Table Tennis career, but in general, I just want to be the best person that I can be.